It is always important to try to use water more efficiently—but there are times when it becomes even more important, such as when drought occurs. Drought happens somewhere in the U.S. every year. In recent years California has faced one of its most severe droughts on record and, in September 2012, 65 percent of the country was in drought. Drought can be considered a slow motion natural disaster. During the 2012 drought, many communities struggled to provide important water services and economic losses were in the billions. 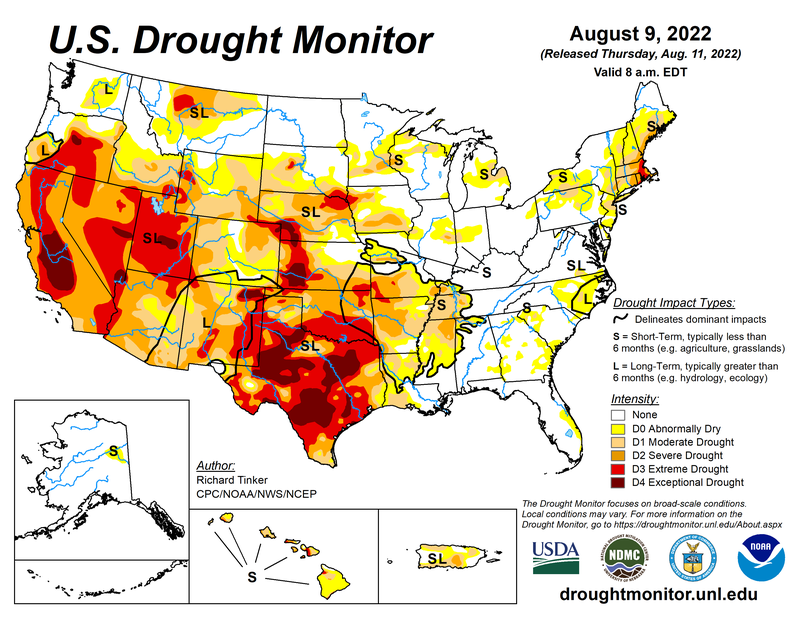 The Drought Monitor provides weekly updates of the status of drought in the U.S.
During a drought, your water utility may ask you to limit your outdoor watering or impose other restrictions. But all members of a community can step up their savings to ensure that water is available to meet critical needs. Here are some tips to keep in mind. Follow the rules: Your water utility must ensure water is available to fight fires and meet other critical needs, so help your community by following the rules. They will be lifted when water shortages end. Look for leaks: The last thing you want to do during a drought is waste water through leaks. Look for leaks indoors and out, and if you find them, fix them. Consider an upgrade: A drought is a great time to consider a bathroom makeover. You will help your utility with immediate savings and save yourself money on future bills. WaterSense labeled products are a great way to save! Take a sprinkler break: Outdoor water use can put a lot of stress on local water supplies. You can be water-smart by letting your grass grow longer and making other maintenance adjustments. Grass doesn’t need to be green year round—you can cut back on watering and the green will return when rains return. WaterSense has lots of water-saving tips for drought resilient landscapes. If you’re interested in some quick-fix tips for the summer months, see our When It’s Hot page. Go the extra mile: If you want to go above and beyond in water savings, think about reusing water. You can collect water in a bucket while waiting for the shower to warm up or when washing pots, and use it to water container plants or flower beds. Use your imagination to come up with creative ways to save water or see more WaterSense tips on our start saving page. This information is also available in PDF format on our Drought Fact Sheet (1 pp, 672 K, About PDF) and en Español, Hoja Informativa de Sequía(1 pp, 271 K, About PDF).